WASHINGTON – Sitting adjacent to the Anacostia River, D.C. Mayor Vincent Gray signed into law a bill banning the widespread use of Styrofoam in the District. “Signing this second bill removes obstacles and provides key incentives to help make the District healthier, greener, and more livable for all,” the mayor said in a statement. 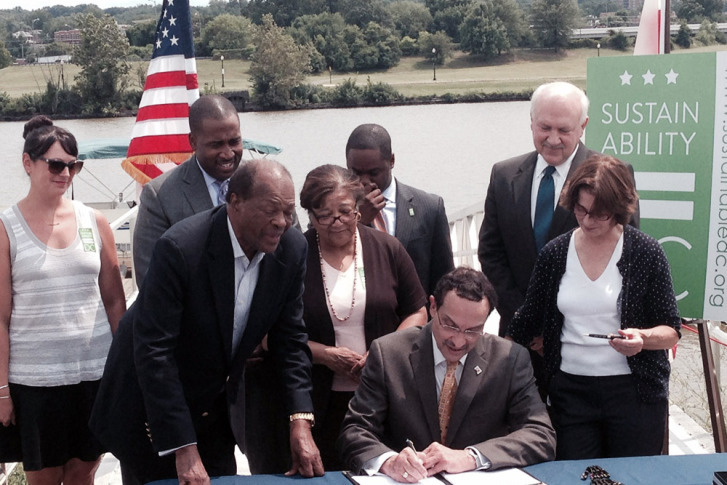 The new law builds on a sustainability law passed in 2013 and aims to clean up the Anacostia. The law requires restaurants, food trucks and other businesses that serve food to use decomposable or recyclable material instead of Styrofoam. The bill also addresses public transit, beekeeping and tree replacement among other environmental issues. WASHINGTON (AP) — Mayor Vincent Gray plans to sign a bill that would ban the use of plastic foam food containers in the District of Columbia. The ban on Styrofoam and similar materials is part of a larger environmental cleanup bill approved by the D.C. Council. Gray plans to sign the bill on Tuesday. The District would join cities including Seattle and San Francisco that have banned plastic foam for environmental reasons. The ban will take effect starting in 2016. Meat trays in grocery stores will be exempt. Four years ago, the District imposed a 5-cent fee on plastic bags, which advocates credit for reducing the number of discarded bags that end up in the Anacostia River.